Fresh, warm, boring (not at all!!) white bread. “White bread.” Linguistic usages abound for this necessary commodity that have nothing to do with yeast and flour. Here in Canada and the USA “white bread” is often used as a disparaging remark, in much the same way as the opening quote. throw it out and start again. It is meant to refer to the boring (and uninteresting) nature of white middle class culture in our two countries. It apparently started to be used in print in the 1980s, although I assume common usage was well before that. Its use is almost completely limited to Canada and the USA. "White bread" defines sections of the middle class that hold views that are "naively wholesome", backward, and out of step with those of modern, “cultured” sections of society. In effect, it is meant to insult the “suburban” classes. I hate to admit it, but in some aspects I tend to agree. Whole heartedly, if not whole wheatedly. Another, somewhat more positive phrase, is “the best thing since sliced bread.” This phrase came about in the 1930s as promotion for commercial bread making where the loaves were purchased pre-sliced. This was a marketing time saver for the harried homemaker. No longer did she (not sexist, just sayin' how it was in 1930) have to suffer the drudgery of opening the knife drawer and slicing bread for her family. 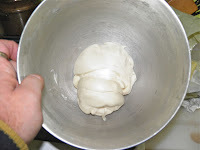 The dough right after kneading. Sadly, the commercialization of baking made the baked product so far from the wholesomeness of homemade that bread makers found it necessary to add vitamins and minerals to their loaves to increase the nutrient value. So was it “the best thing”? In as much as each phrase is ingrained in our cultural makeup, the truth of the matter is that white bread is a necessity we should all know how to make – and slice – at home. 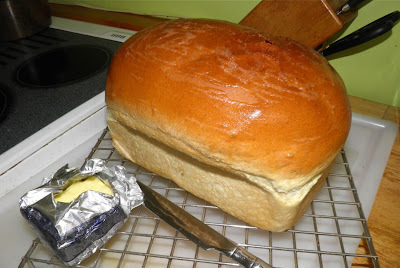 Homemade white bread, fresh from the oven, is delicious. It also is surprisingly easy to make. After 1 hour rising in a warm spot. towel wrapped around the bowl. The ingredients are amazingly simple. Yeast, water, sugar and butter (sometimes), salt and flour. That’s all it takes. If you have a warm spot somewhere that ensures the yeast will rise, the whole operation only takes a little more than 2 hours. 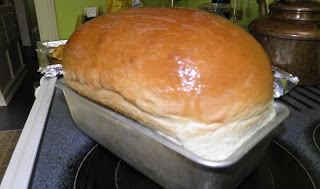 In that time you can have loaves of fresh bread cooling on the counter for use in sandwiches and dinners for the week. One word of caution. Since white bread doesn’t have stablizers to increase shelf life it can go stale in 2-3 days. Luckily bread freezes well so if you make more than you can use in a few days you can keep loaves for later in the freezer. This recipe is scalable, meaning it can be doubled or tripled with ease. This means for the same amount of work you have your whole week’s worth of bread. Shaped and ready for the second rise. If you wanted to make bread that lasted a few days longer make a “starter” overnight with the yeast, water and 1/3 of the flour. Then proceed on in the morning. 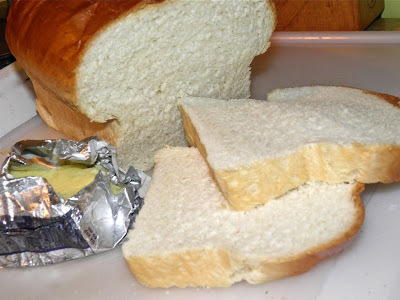 Everyone should know how to make a loaf of white bread, either for keeping grocery costs down, or presenting on special occasions to impress friends and family. Regardless of the bad rap that white bread may have, homemade is a marvellous thing. 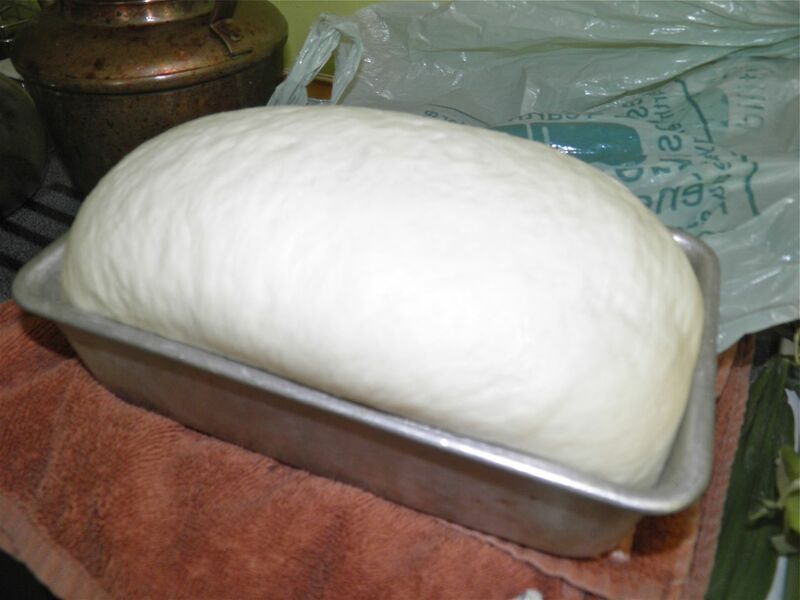 keep in mind, the majority of time making bread is in the rising, so you can do other things white that is happening. 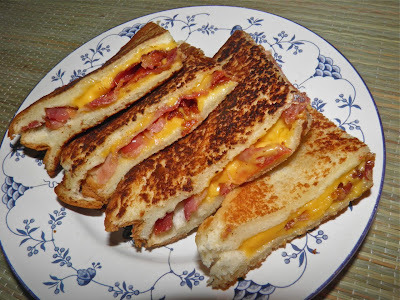 Part of my loaf was used for grilled cheese sandwiches (bottom photo). Divine. 30 minutes later, after the second rise. Sprinkle the salt on top of the yeast. 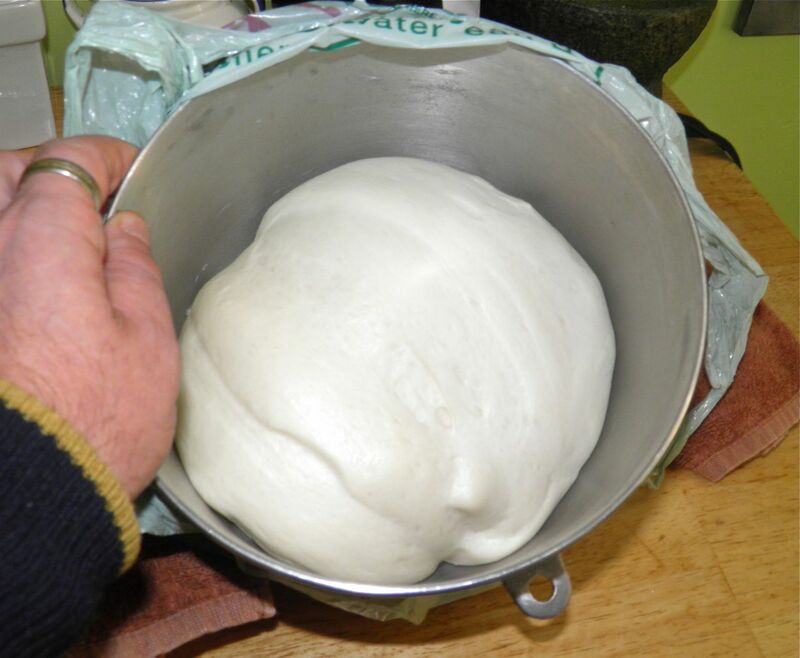 Place the bowl on the mixer fitted with a dough hook. Slowly add the flour until it is all incorporated. then knead the dough for about 8 minutes. 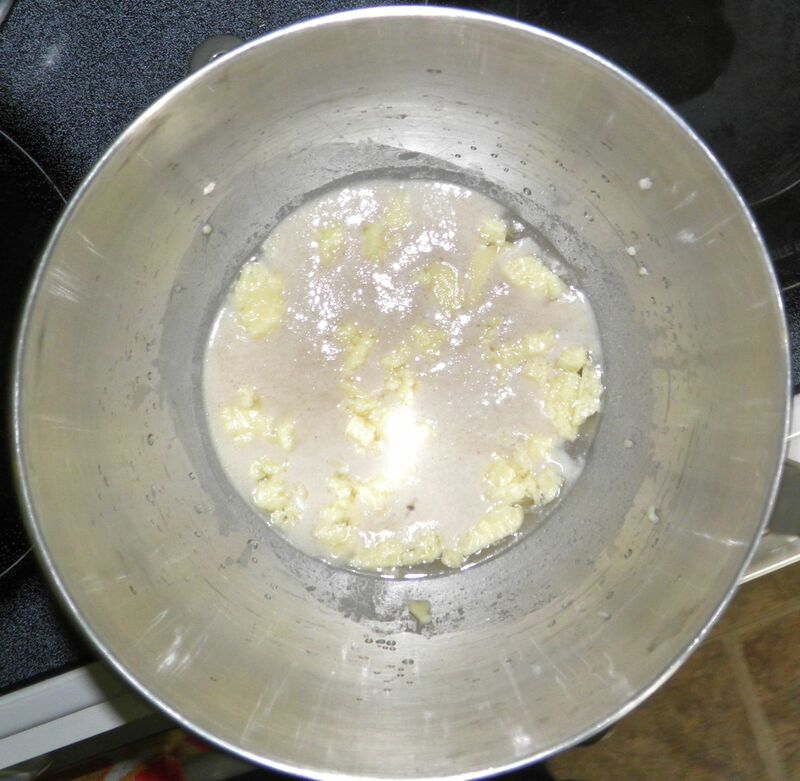 If all the flour doesn’t incorporate add water by tablespoons. If it’s too wet, do the same with flour. The moisture content of flour can vary from day to day so the water/flour ratio is never exactly the same. 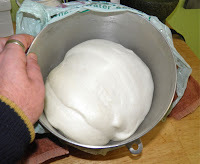 Alternatively you can add the flour by hand if you don’t have a dough hook, but kneading should take 12 minutes. The end result is the same: a smooth ball of dough that is very moist feeling but not sticky. 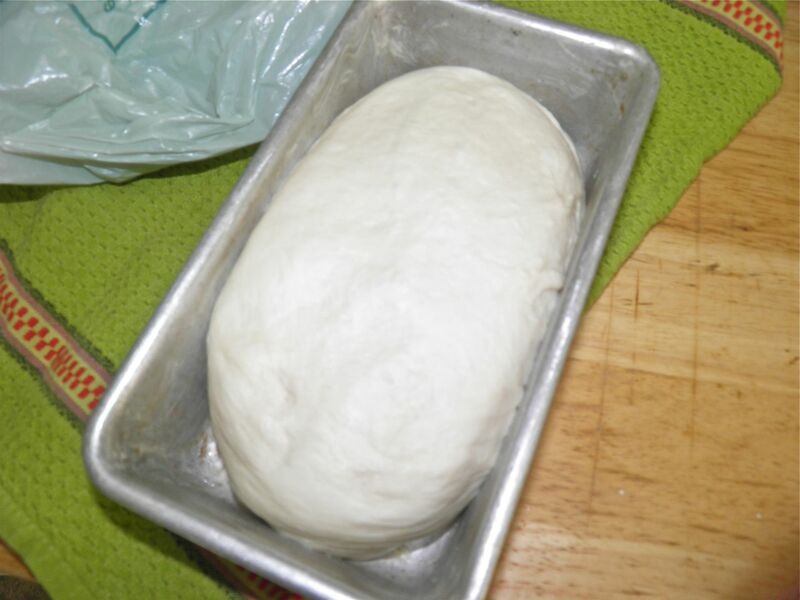 Cover the kneaded dough in a bowl and let rise until double, about 1 hour. After the first rise, punch it down, shape into an oblong and place in a buttered 5x9 loaf pan. Let the dough rise again until it reaches above the pan, about another 30 minutes. Preheat the oven to 350°F. Place the risen loaf in the oven and let bake for about 30 minutes, until it is browned on top and sounds hollow when tapped. Remove from the oven and let cool for 10 minutes. Then remove from the pan. For a soft top rub the loaf with butter while it’s still warm. * The sugar is up to you. Either will work. The higher amount makes a slightly sweeter loaf, as one would assume… 1 packet of yeast (2.5 tsp) is enough to raise 4 cups of flour, but it may take longer than the time I have listed. I prefer the speed of the tablespoon of yeast. It also adds a little more yeasty flavour to the finished product. Feel free to add the lesser amount if you wish. Grilled cheese sandwiches. I paired this with a cream of roasted celery soup. That's tomorrow's post. Y'all come back now, hear? I'm a long way from the Maritimes, in Victoria, BC now, but your baked beans and brown bread broight memories of the East Coast. If anything can bring the East Coast home wherever you are it's baked beans and brown bread. My recipe for raisin bread is quite a lot like Snair's, if you're familiar with that brand. I'm torn between the two. Thanks for your comment. D.